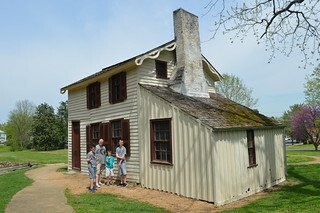 Our children had gone to Virginia to spend Spring break with their grandparents, who had flown over from England. On the Tuesday, Mr Pict and I were able to travel south to join them. 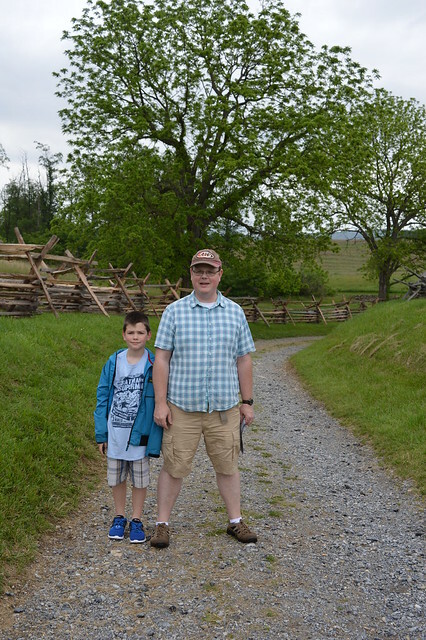 As regular readers of this blog will know, my husband is a Civil War nerd. 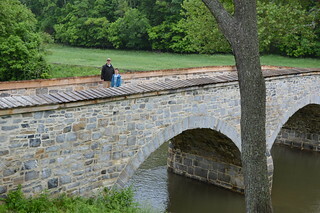 He was, therefore, relishing the prospect of spending some time mooching around Civil War sites in Virginia, though he agreed to restrict himself to the Peninsula Campaign of 1862 for this trip. 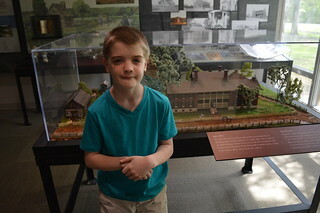 On our journey south, needing a comfort break, he selected the National Park visitor centre at the Tredegar Iron Works. 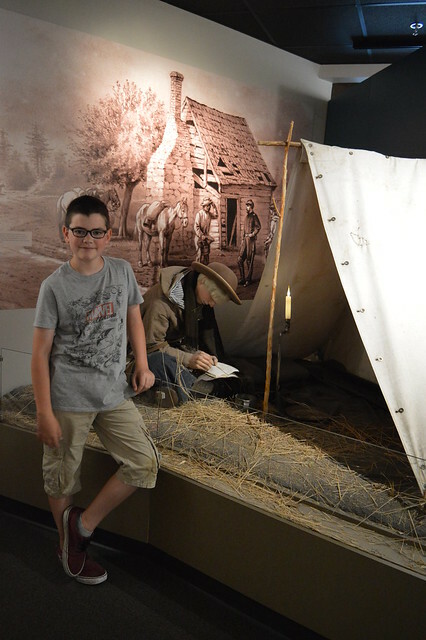 While I availed myself of the restroom, Mr Pict undertook a warp speed visit of the visitor centre and determined that we should return some time with the kids. 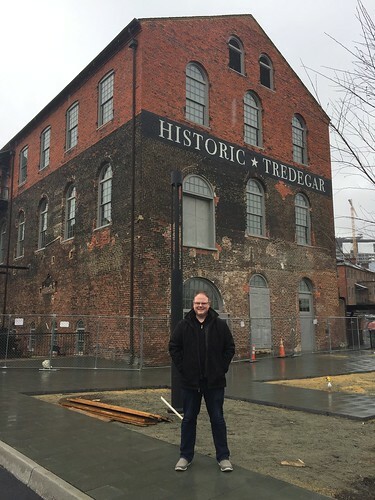 It was largely determined that Richmond should serve as the capital of the Confederacy because of these iron works so it is a significant site. I did like that the visitor centre was housed within such a historic building. 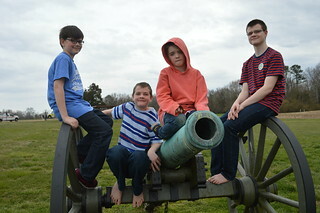 The next morning, with the four boys and my in-laws in tow, Mr Pict took us on a tour of Civil War sites. We started at Yorktown. 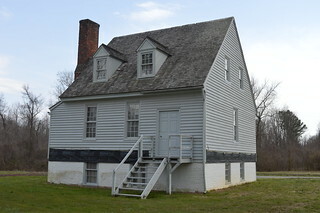 Yorktown is more strongly associated with the War of Independence and so it proved to be at the National Park. 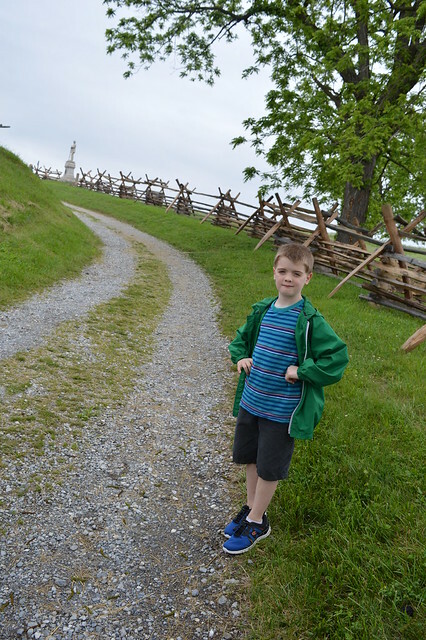 The focus was very much on Revolutionary history with just a slight nod to its place in the Civil War. At the risk of muddying the waters of the boys’ learning for the day, we subjected them to the film about the history of Yorktown. I write “subjected” because it had not been updated since probably the 1980s and the quality of performances and production values were pretty tragic. 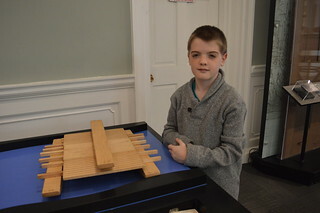 I am not sure, therefore, that the boys engaged much with the film but hopefully some learning stuck and they at least took away from it that it was the place where Cornwallis surrendered. 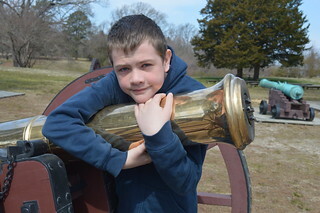 They did, however, enjoy the various canons outside the visitor centre. 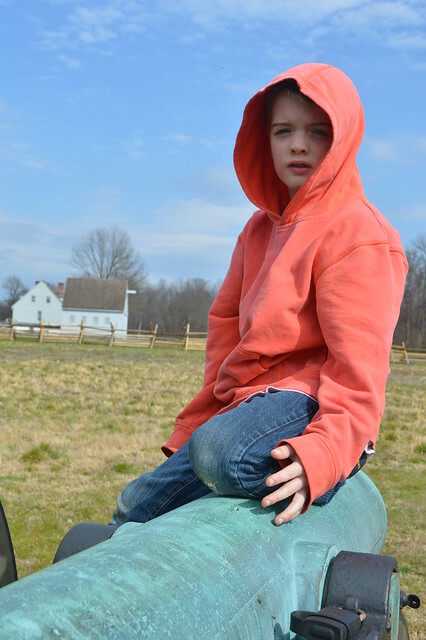 There was to be a lot of clambering on canons that day. 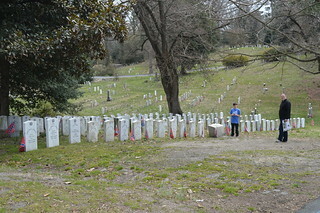 Our next stop was the Hollywood Cemetery in Richmond. As regular readers will know, I absolutely love cemeteries. While I personally enjoy just wandering around and appreciating the memorial architecture and funerary sculpture, it is always useful to have some famous burials to search out and provide focus to the wanderings. 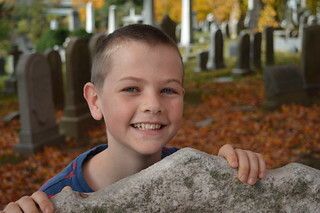 Turning a cemetery visit into a “treasure hunt” also helps engage the kids. The reason for our visit was because the cemetery, while a public cemetery rather than a military one, is chock full of confederate graves. It, therefore, formed part of Mr Pict’s Civil War tour. 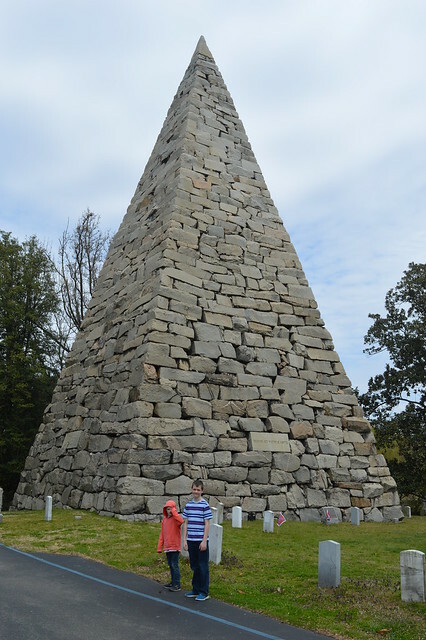 We started with a massive granite pyramid erected to commemorate the confederate dead. 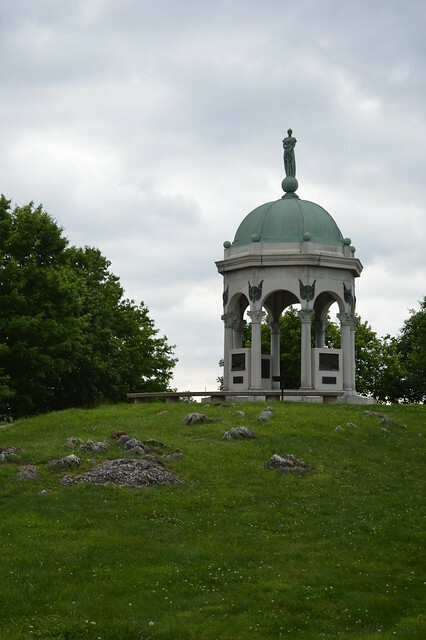 It was in an area where the confederate dead of Gettysburg had been interred following their recovery from the Pennsylvania battlefield. 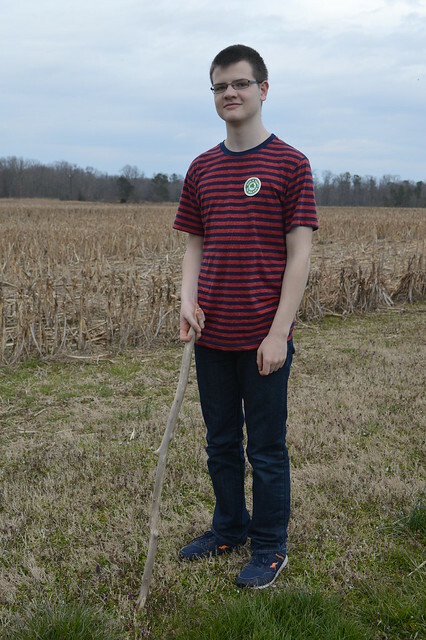 Can you imagine the grim task of locating all of the remains on the battlefield and preparing them for transportation to Virginia? 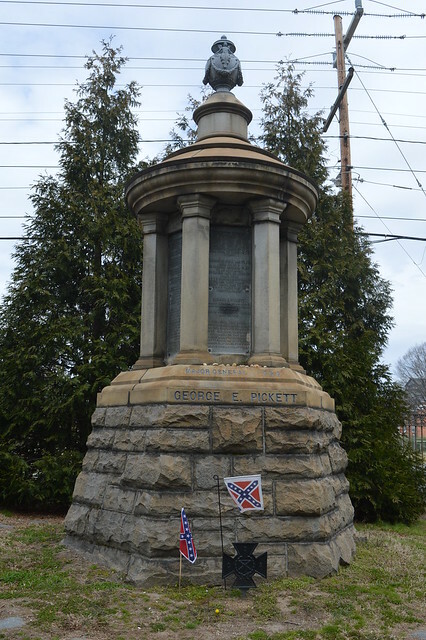 Nearby was the grave of George Pickett, he of Pickett’s Charge. 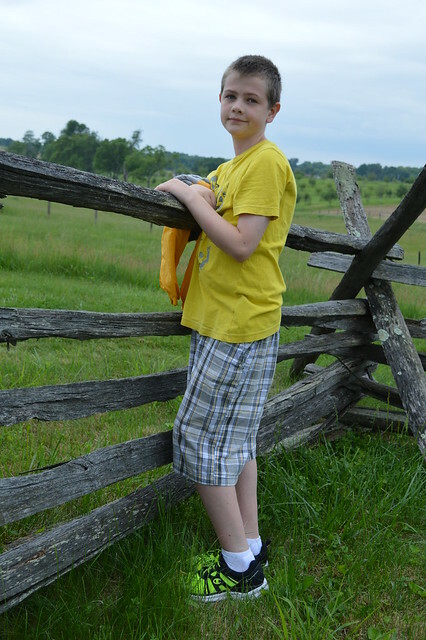 We also saw the grave of JEB Stuart. I have no political, ideological difficulty with the commemoration of the confederate dead within the context of a cemetery. The confines of a cemetery’s walls makes it about the living processing the grief of lost loved ones. I can think that these are people who chose to fight on the wrong side of history, who were fighting to uphold an appallingly horrific system, who may even, particularly in the case of the military leaders, have been loathome, morally bankrupt individuals. But I can square that against them being someone’s father, someone’s son, someone’s brother, and therefore deserving of being buried with dignity and not left on a battlefield to moulder. 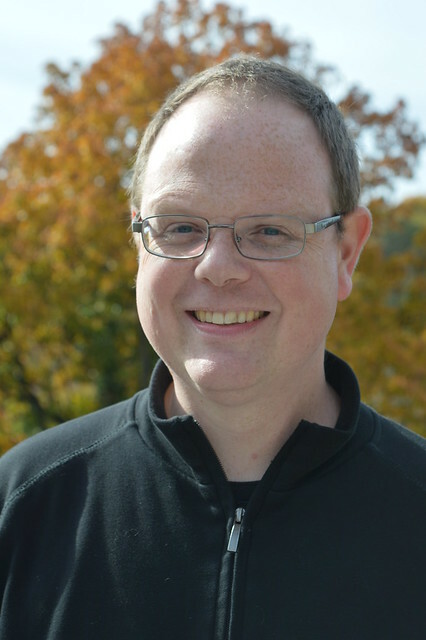 What I have real difficulty with is when commemoration moves into the realm of celebration. That is why I support the removal of confederate statues from public spaces. Again, while tricky in the context of a cemetery, there was definitely something that troubled me about the grave of Jefferson Davis. 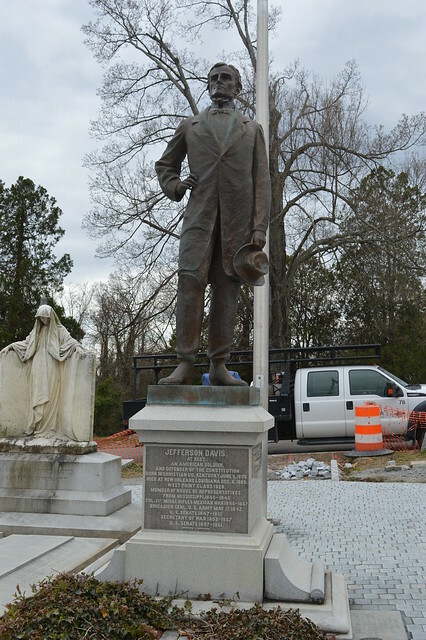 The fact that some workers were placing new cobbles around Davis’ statue, in order to make the whole area look polished and smart, seemed to me to underscore the fact that this was a site that was being venerated. Then there were all the flags. Those flags always make me feel uncomfortable. This was not simply a place where family members could come and pay their respects to a departed love one, gather their thoughts about their experience of loss; this was a space that was bigger than that and was imbued with more political meaning than that. It was weird. Just weird. Hollywood is also the final resting place of two American Presidents. 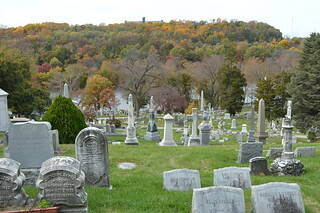 They are buried within the same attractive circle in an area of the cemetery that is elevated and provides a striking view over the river. 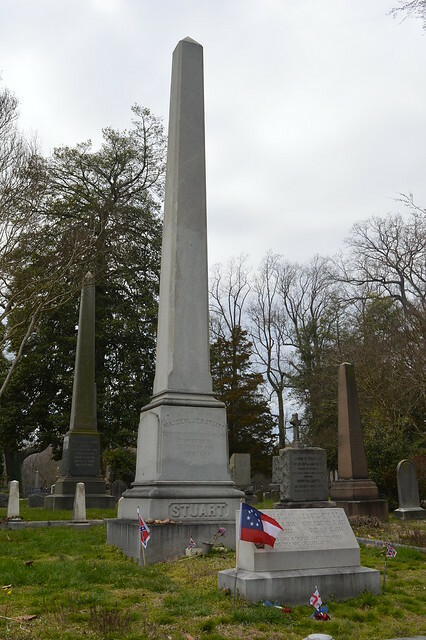 James Monroe, fifth President, had a very unusual tomb, an elaborate and fancy cast iron structure, reminiscent of a gothic church, surrounding his granite coffin. I read that it was known as the “birdcage” which is entirely apt. 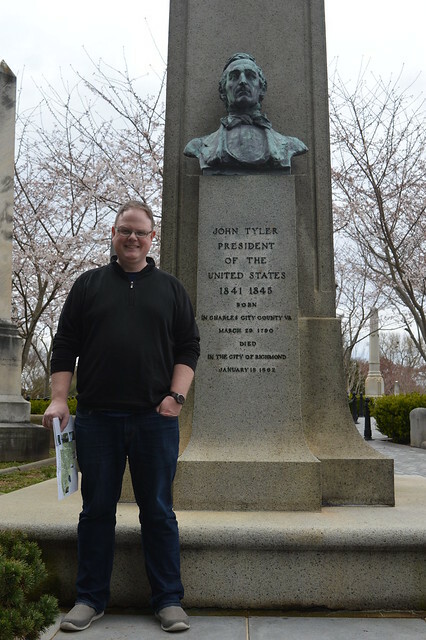 Just a hop, skip, and a jump from Monroe’s grave was the monument to John Tyler, tenth President. Tyler famously became President when William Henry Harrison died just one month into his presidency. 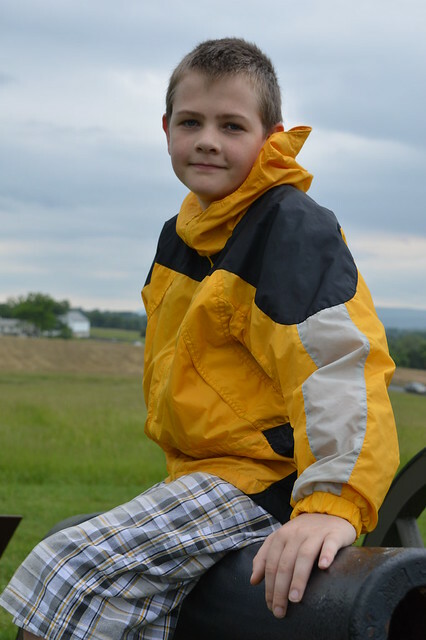 He also has two grandsons still living. Imagine having a grandfather who was born in 1790? 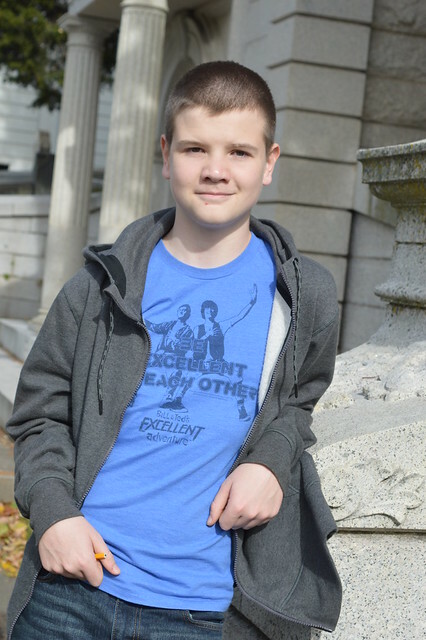 His grave was marked by an obelisk with a bust built into its front facade. 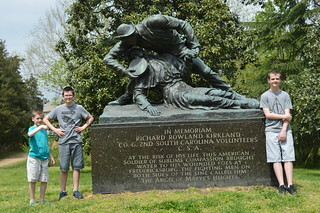 After Hollywood Cemetery, Mr Pict took us to visit battlefield after battlefield. 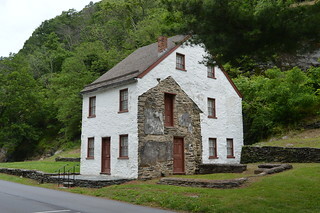 The first was Gaines Mill and it was only slightly more interesting than the sites that followed because of the presence of a house. Mr Pict and his father were very interested in a creek that ran through some woods that flanked the fields and went off for a wander there but to my mind the site was pretty featureless except for that house. 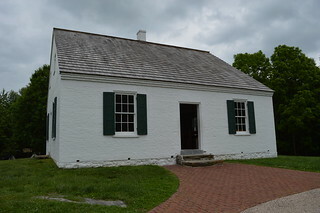 I read that the house was home to an elderly widow whose slaves carried her out of the house on the day of the battle. She was never able to return home because the house was all but destroyed during the conflict. I think the next stop was named Glendale Crossroad or Frayer’s Farm but I didn’t even bother to get out of the car for that stop and cannot remember what my husband told me about it. As far as I was concerned, it was literally a crossroad and there was nothing to see. 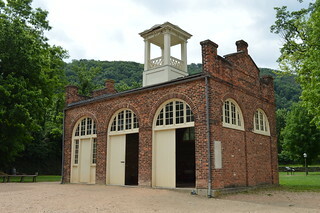 The last stop was at a spot named Malvern Mill. Mr Pict was very keen on this spot and explained why but I did not absorb the information. To me, these were literally just fields filled with scrub or the stubble of old crops. 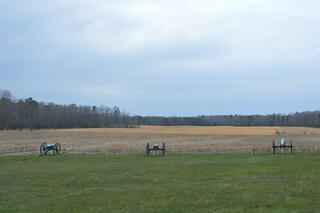 The only thing that indicated it was a place of historic significance was the presence of canons lining the field. 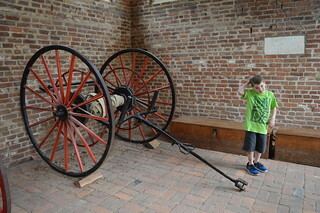 The boys enjoyed clambering on the canon and seeing a whole car lot filled with fire trucks as firefighters were running a controlled fire nearby. 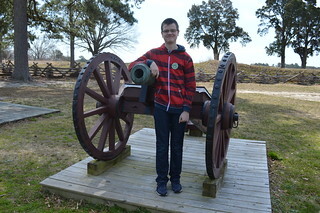 I would like to claim that I learned something new or interesting about the Civil War that day but honestly I did not. I am none the wiser about the Peninsula Campaign than I was before because I just could not absorb the information my husband was sharing with us. My brain just is not that keen on military history, what can I say. 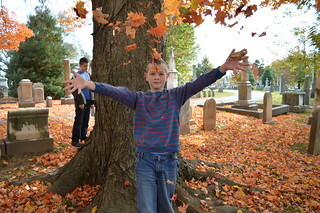 Still, the cemetery was attractive and Mr Pict was very happy so it was a day well spent. 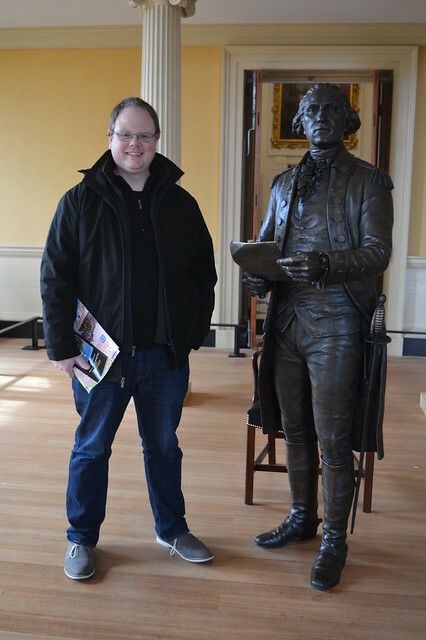 For reasons too tedious to explain but involving leave entitlement, ceaseless winter storms, and rolling rescheduling, Mr Pict and I found ourselves spending a weekend driving to and from Washington DC. 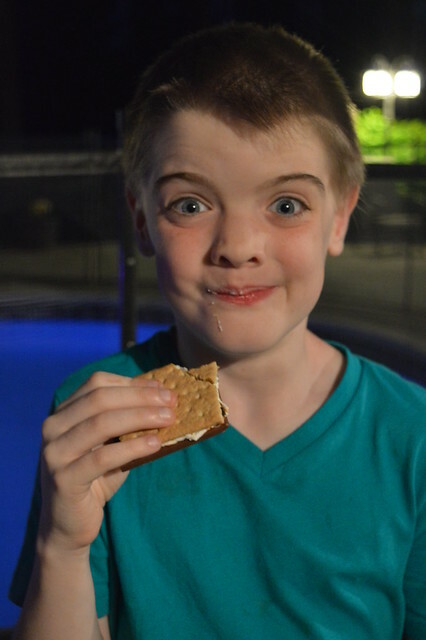 My in-laws had flown in from England and met us there in order to then take our four children on a Spring break vacation. 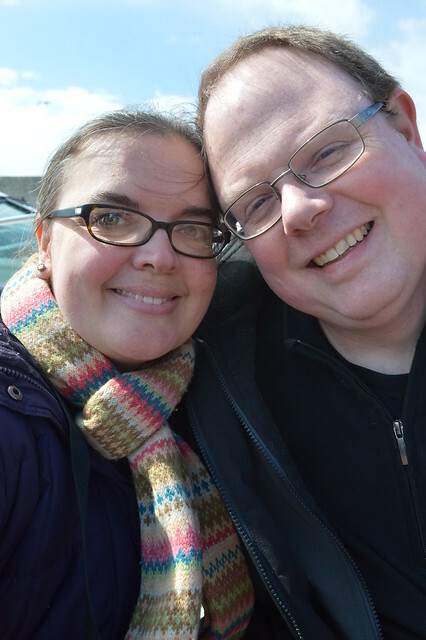 Mr Pict and I, therefore, found ourselves unexpectedly child-free in Washington DC. We spent the evening catching up with friends over dinner and wine. 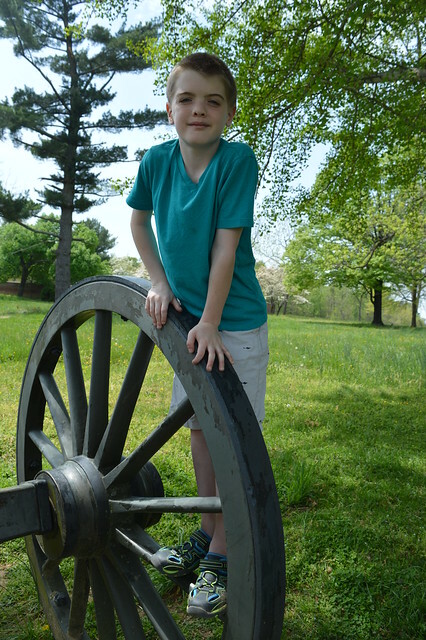 Before I earned that grown up treat, however, I had to trail my husband around some Civil War sites he had never visited. 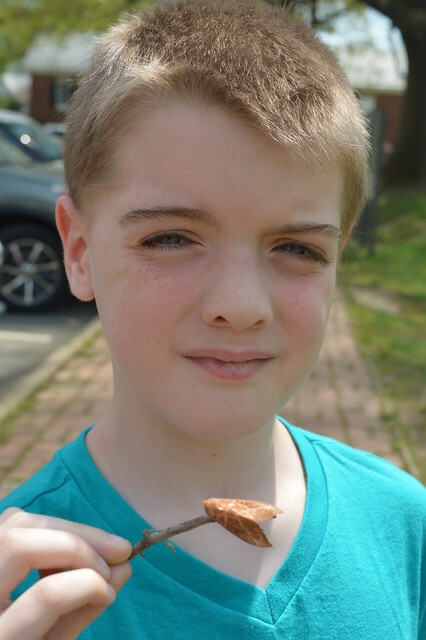 As I have previously explained, my husband spent his early teens living in the suburbs of DC. How he managed to live there for years plus have us return from the UK to visit his parents several times without ever visiting these sites is beyond me. 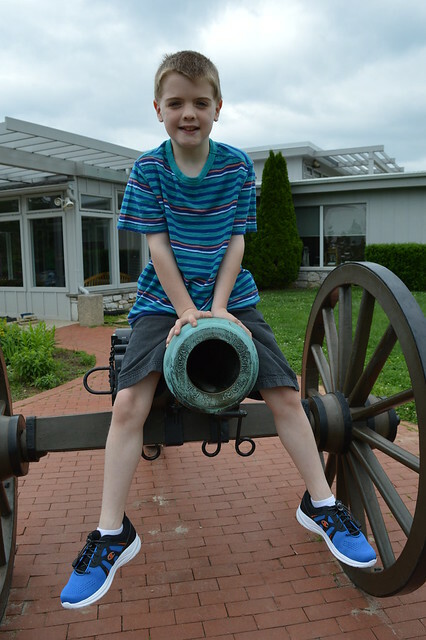 However, as a Civil War nerd, it is on his bucket list to visit just about every obscure Civil War site in the nation so I was happy to indulge him and his bucket list collecting. 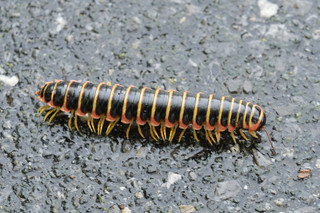 First up was Fort Stevens. I don’t know why I made any sort of assumptions but I had expected the site to be a little more grand or at least cared for than it clearly was. 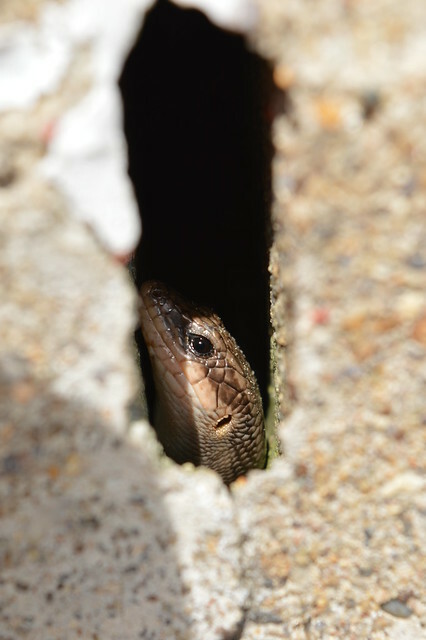 Instead, what I found were some mounds of earth on a patch of scrappy grass in the middle of a residential neighbourhood, a couple of canons surrounded by litter and broken glass, and the noise of a construction site that abutted the remains of the fort. 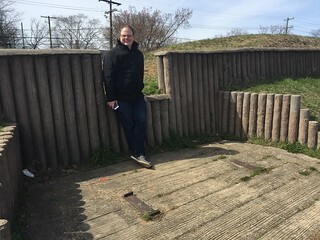 Fort Stevens’ significance rests in the fact that it was the site of the only Civil War battle to take place within the limits of the nation’s capital and it was the only time when a serving President came under enemy fire. 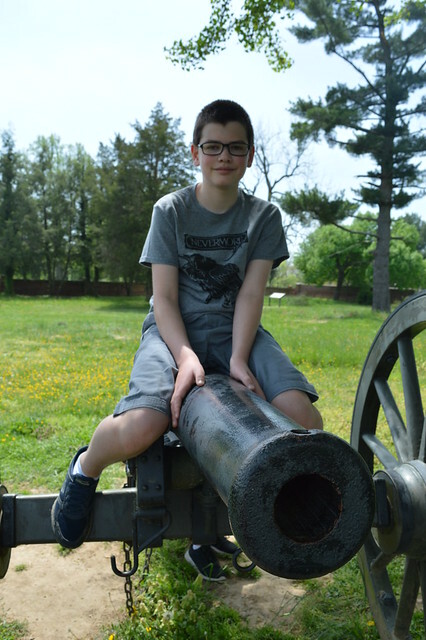 The history is that, in July 1864, Jubal Early’s Confederate troops decided to march on the capital following a battle in nearby Frederick. 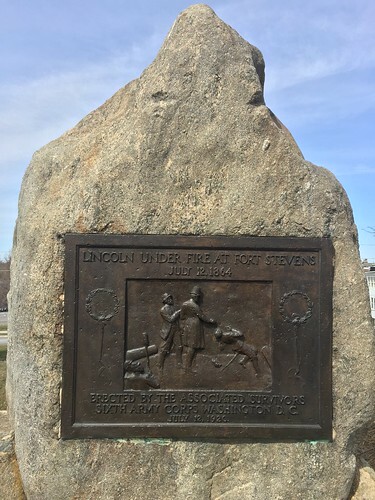 They encountered Fort Stevens – one of a series of forts protecting the city – and there was a brief battle that repelled the Confederate soldiers. 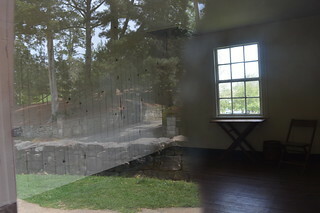 Lincoln and his wife visited the fort and witnessed the battle, hence his coming under fire. 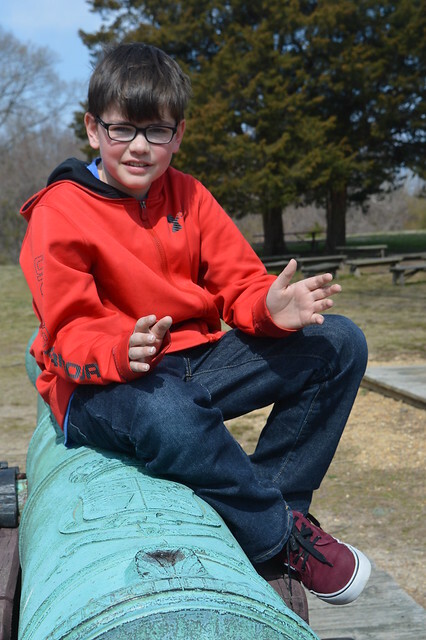 A rock with a bronze plaque marks the spot where Lincoln stood on the earthworks. I was underwhelmed by Fort Stevens but the next stop on the itinerary was a little more my cup of tea in that it was a cemetery. Battleground Cemetery contains the graves of the 40 soldiers who died in the defence of Fort Stevens and others who fought there – the last to be interred being buried there as recently as 1936. 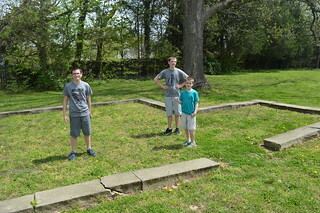 Again there was a Lincoln connection since Abe attended the burial cemetery and dedicated the land, which makes it one of America’s smallest national cemeteries. It was indeed a modest cemetery. There were a few regimental memorials within its walls but the graves themselves were very small and simple and arranged in a circle. It was well-maintained and a tiny pocket of peace and quiet despite being within a major city. 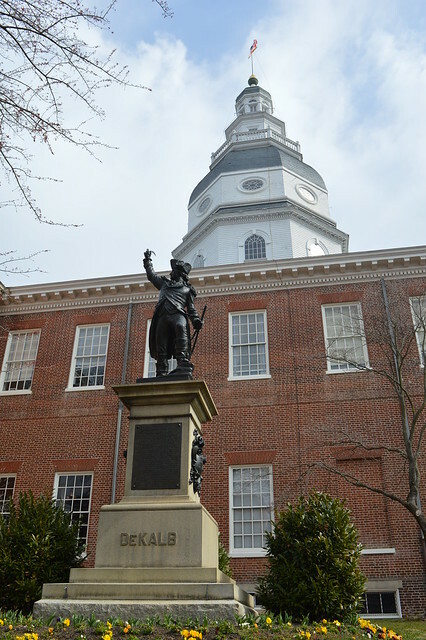 The following day we decided to stop off in Annapolis as we wended our way back to the Philly suburbs. Being a bitterly cold Sunday in March, there was not an awful lot for us to do but wander around and absorb the charm of Annapolis’ historic district. 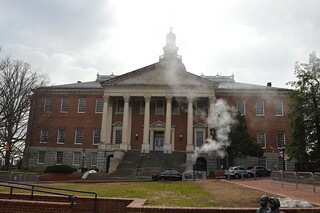 To give our pit stop a little more focus, we decided to visit the Maryland State House. 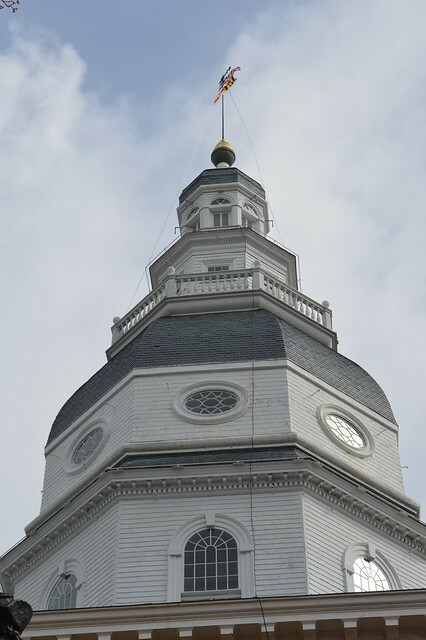 Occupied since the 1770s, it is the oldest state capitol in continuous use and once served as the nation’s capitol. 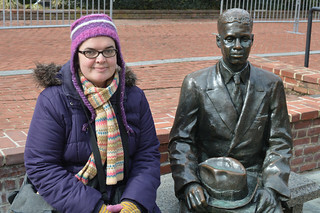 I started out my visit there by stopping by the statue of Thurgood Marshall. 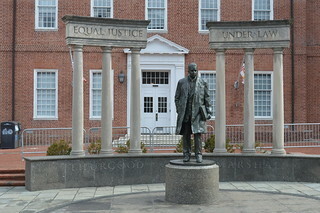 It depicts Marshall as a young lawyer at the start of his career and behind him are pillars reading “Equal Justice Under Law”. 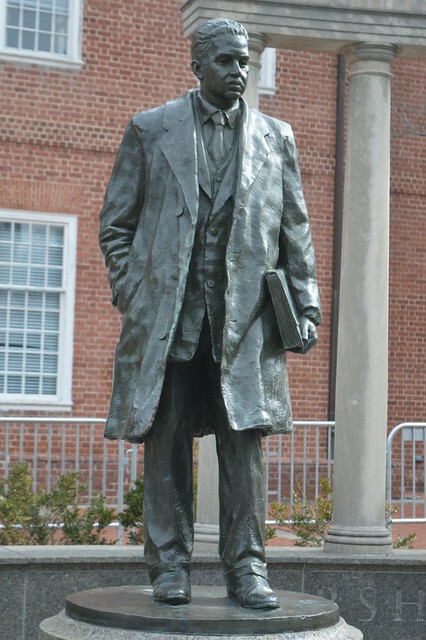 The sculpture also contains three other related statues: one of Donald Gaines Murray, whose case was one of Marshall’s early victories in the fight to desegregate schools, and two children who symbolise Brown V the Board of Education. 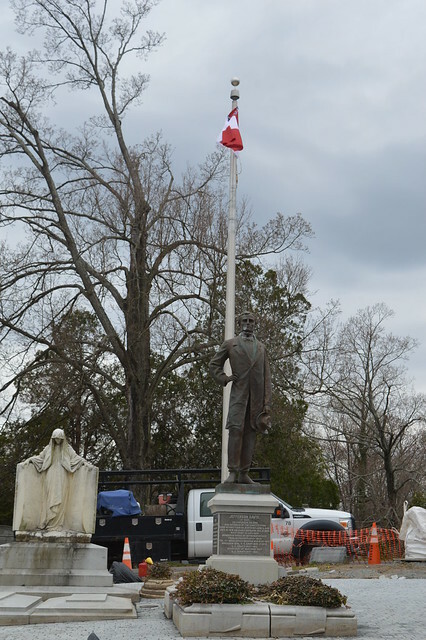 It used to be the case that a statue of Roger Taney stood on the grounds but his statue was removed last year. 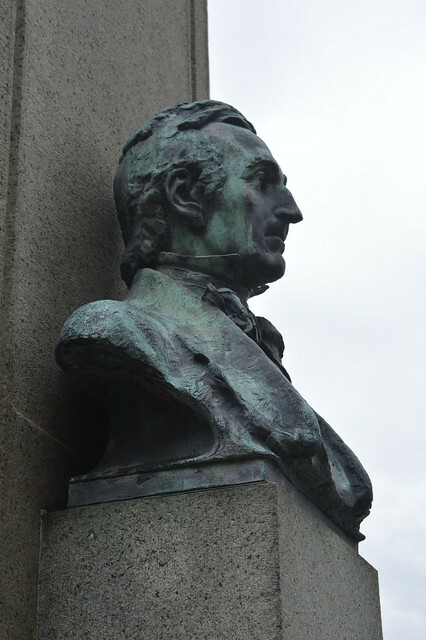 I personally was glad to see Marshall celebrated at the State House and to see Taney’s absence. 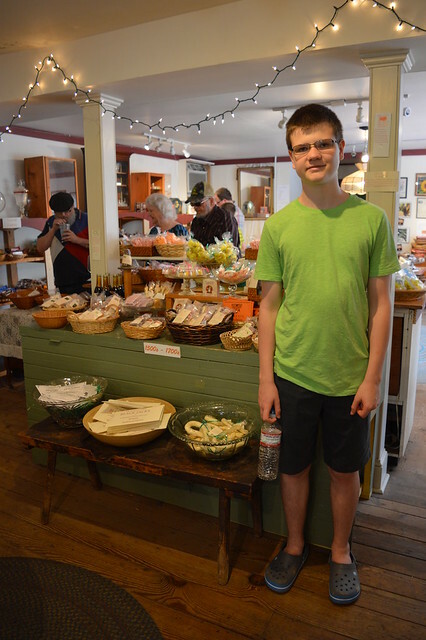 Once inside, we explored the various rooms on a self-guided tour. We had the whole place virtually to ourselves so it was very relaxing and informal. 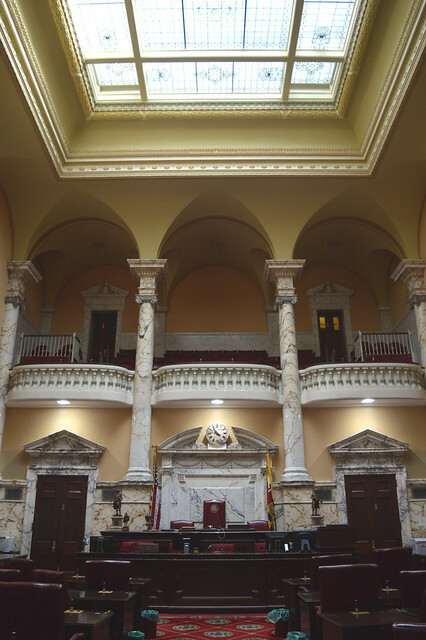 We had a peek into the current Senate and House chambers. Mr Pict enjoyed seeing the voting buttons on each desk whereas I was enamoured of the Tiffany skylights. The Caucus room was very dark but was filled with gleaming silverware. This was a service from the USS Maryland which is designed with lots of references and symbols relating to the state. I like things that are shiny but the silverware was all a bit fussy for my taste. I wouldn’t want to keep it polished either. Just as well I will never own a silver service set then! Probably the most historically significant room in the State House is the Old Senate Chamber. 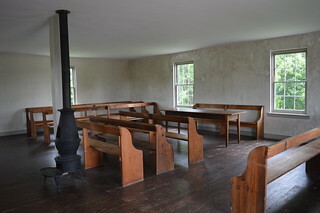 It was in this space, in December 1783, that George Washington resigned his commission as Commander of the Continental Army thus establishing an important precedent for America’s democracy. Back out on the cold streets, we wandered around and poked our noses into the odd shop. 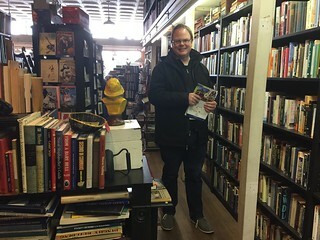 We spent a lot of time rummaging in a very cluttered, very musty, but entirely wonderful book shop. We then wandered down to the Dock area. 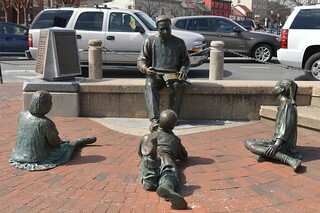 There I found the statue commemorating Alex Haley, author of Roots, and Kunta Kinte, the fictionalised African ancestor of Haley’s that is the starting point of his saga. We sat there and people- and duck-watched for a bit before walking back through the old streets and back to the car. 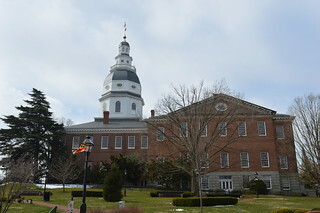 This was my first visit to Annapolis since I first visited in 1995 and I had forgotten how quaint and attractive it is. 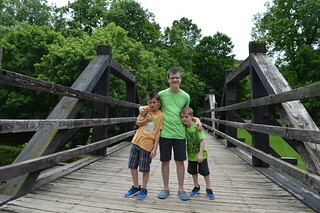 At some point we will have to return with the kids, in warmer temperatures, and when there is more to do. Peculiar though it might seem, for my birthday trip I chose to go for an explore of Laurel Hill Cemetery. Although I don’t think I qualify as a taphophile, I have always loved cemeteries. 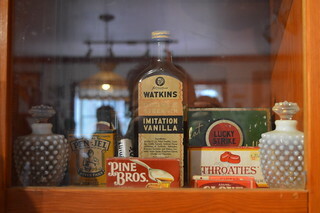 Along with museums, art galleries and libraries, they are my favourite places to visit. 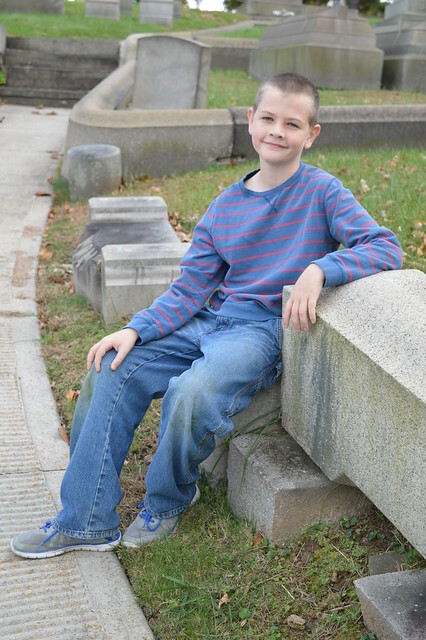 Cemetery trips feature not infrequently on this blog as a result. 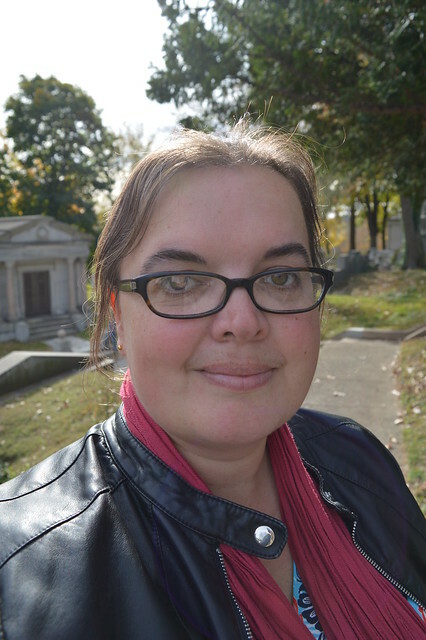 It is only surprising, therefore, that it has taken me three years of living in the suburbs of Philadelphia before visiting one of its historic cemeteries. 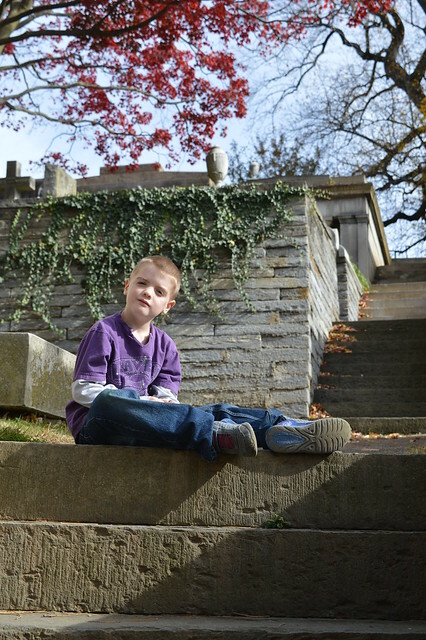 Laurel Hill Cemetery sits on a hillside above the Schuylkill River and covers a huge expanse of land. With all the Autumn colour in the trees, it was a rather beautiful spot for a wander even regardless of the history and funerary sculpture. The cemetery was founded as a garden cemetery in 1836, originally rural but soon eaten up by the growing city. In some ways it was reminiscent of the huge municipal London cemeteries I always loved visiting (Kensal Green being my favourite) but it was a little more organic in design and not as regimented in its organisation. Happily, I had done my usual over-planning thing. 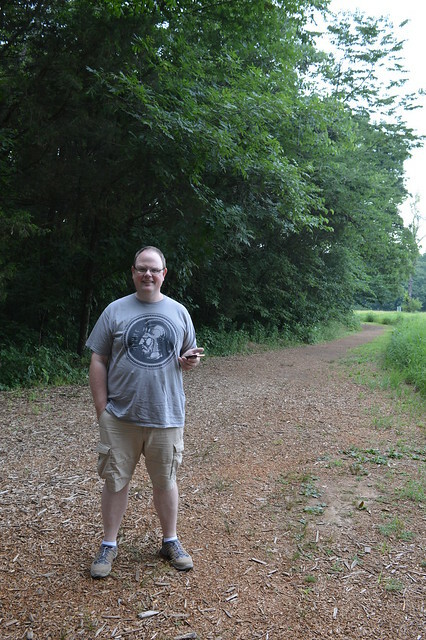 I had printed off a map of the cemetery and used the Find A Grave website to plot the location of the graves I was particularly interested in visiting. This proved useful because not only were the individual plots not numbered but neither were the different areas of the cemetery. 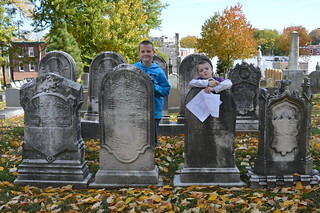 Thanks to my map, however, we were able to locate almost every grave we were searching for. Annoyingly one of the graves I missed was that of Scottish born John Notman, the architect who had designed the cemetery. 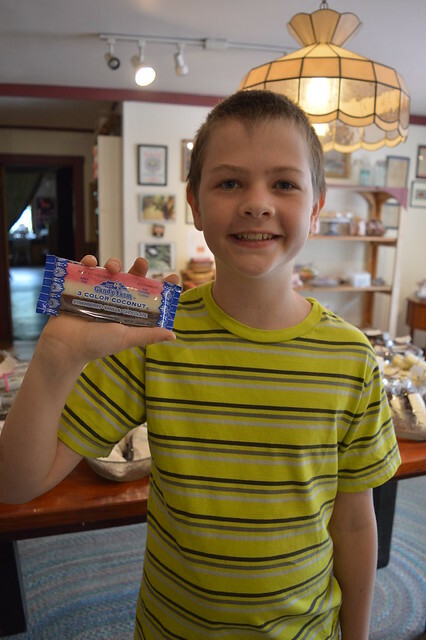 We began our trip by popping into the office where a helpful young man provided us with a bigger version of the map I had printed out and some scavenger hunt activities for the kids. 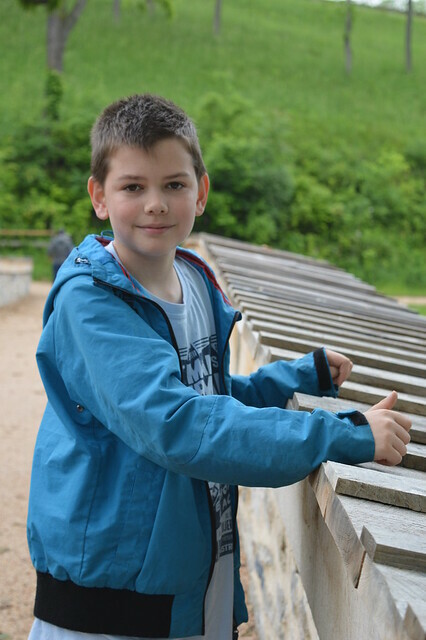 The scavenger hunt was a great idea as it not only kept the kids occupied but also engaged them with subjects such as the symbolism of monumental masonry. 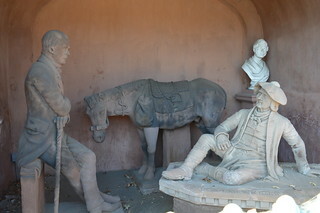 Directly opposite the Gatehouse was a sort of grotto containing a statue depicting Old Mortality, his horse, and the author Sir Walter Scott – plus a bust of their sculptor. In Scott’s story, Old Mortality wanders around Scotland preserving the memories of Covenanters by carving the inscriptions on their headstones. Thematic connection to tombstones aside, it was a tad obscure. 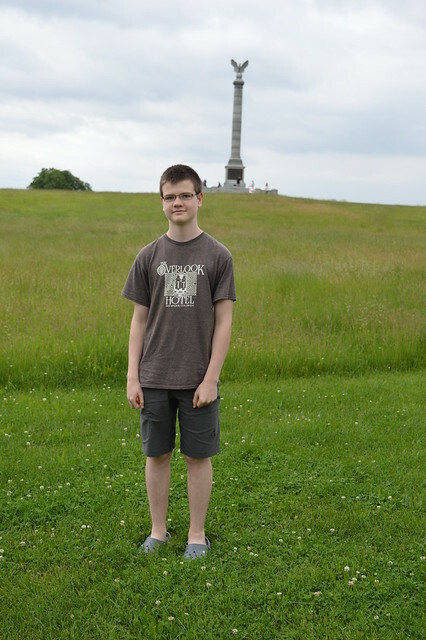 Just behind the statue was our first famous grave of the trip. 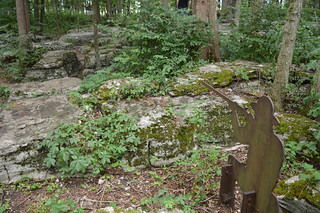 In the shrubbery was the Deringer family plot, including the grave of Henry Deringer, the innovative gunsmith known for the Derringer pistol. 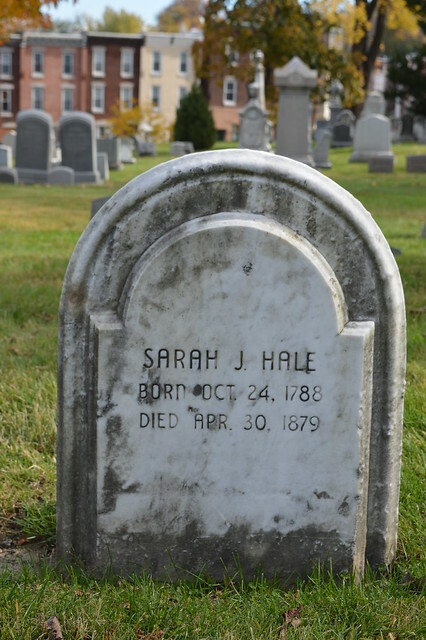 Just a short wander away, I found the unassuming grave of Sarah Josepha Hale. An author and activist, Hale is now principally remembered for two things: it was she who wrote the nursery rhyme ‘Mary had a Little Lamb’ and who successfully campaigned for Thanksgiving to become a national holiday. Although I am not American, I love Thanksgiving so I shall be sure to raise a glass to Hale in a couple of weeks’ time. I visited the graves of a couple of photographers because one of my nerdy interests is the history of photography (partly because I am descended from a Victorian photographer). First up was Frederick Gutekunst, one of the most famous American photographers of his era. His studio particularly boomed as a result of the Civil War as soldiers, including Generals such as Ulysses S Grant, stopped in to have their portraits taken. I was more excited, however, to find the grave of Robert Cornelius. Cornelius was a photographic pioneer who, while experimenting in order to perfect the daguerrotype, in 1839 took a self-portrait which is the first photographic portrait. Cornelius’ grave was small in its own right but was especially small compared to the grand tombstones in that particular area of the cemetery. I was, however, able to spot it from a distance precisely because of that famous selfie because a small oval copy of it was stuck to the fascia of the grave marker. 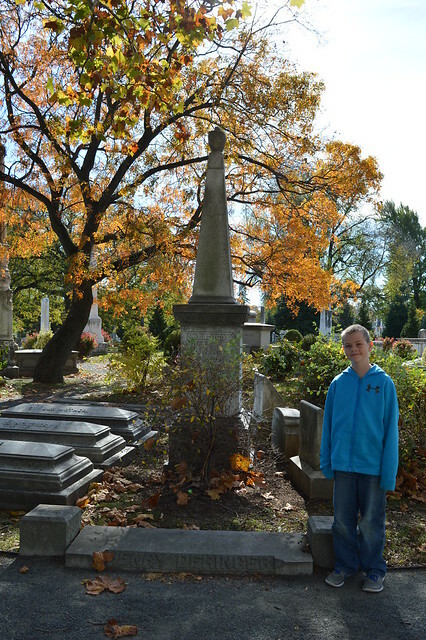 My 11 year old is currently learning about Explorers at school so I dragged him down a few flights of steep stairs past lots of marble mausoleums to find the tomb of Elisha Kent Kane. Kane, a naval medical officer, was part of two Arctic expeditions launched (in vain) to locate and rescue explorer Sir John Franklin. The second search led him to travel further north than anyone had previously managed, thereby paving the way for those Arctic explorers who came after him. 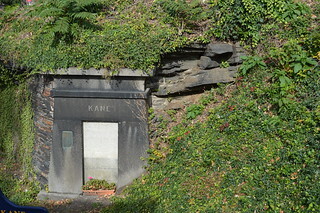 Sadly, the site of Kane’s tomb was overgrown and rather neglected. This was because it was positioned right by the roadside on a fairly steep slope and was, I assume for safety reasons, fenced off from the rest of the cemetery. When Laurel Hill Cemetery was in its infancy, the founders found it a challenge to attract business. People were too used to being buried in graveyards next to whichever building they attended for religious services. They, therefore, had the interesting idea of having the remains of some famous Philadelphians exhumed and then reinterred in the cemetery. As a business practice, that is a tad ghoulish. 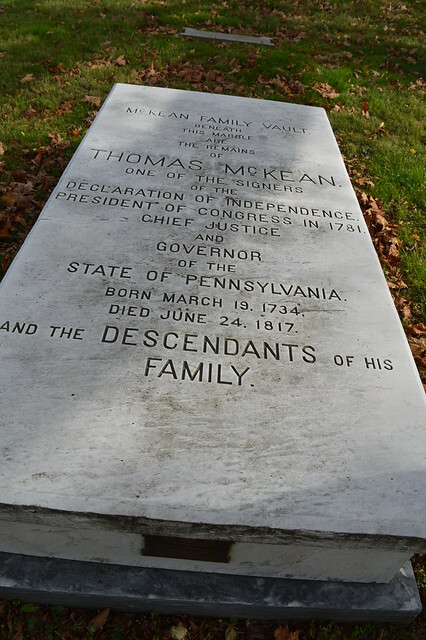 It meant, however, that I got to see the grave of Thomas McKean, one of the signatories of the Declaration of Independence, and David Rittenhouse, astronomer, surveyor, and first director of the US Mint. 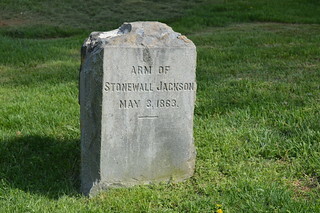 The cemetery contains many military graves, including those of over 40 Civil War Generals. 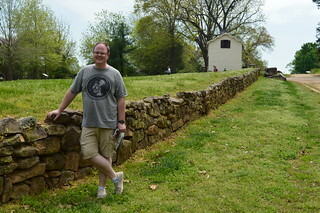 As you may recall, Mr Pict is a Civil War nerd so he was particularly interested in spotting the Civil War graves. 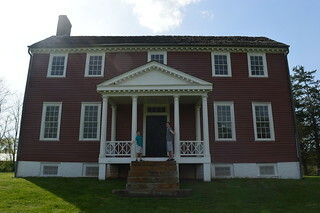 The two most significant of these that we visited were those of Generals Meade and Pemberton. 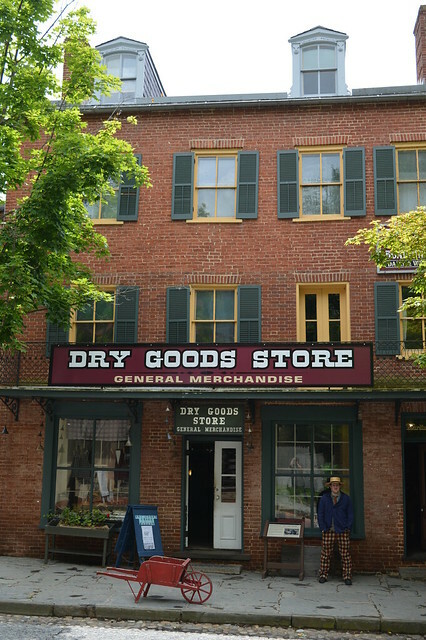 General George Meade was a career military man involved in many conflicts but he is known to me for his part in Gettysburg where he led the Army of the Potomac, helped secure the Union’s victory, and contributed to that turning point in the war. Because Mr Pict takes us all off to Gettysburg at least once a year, Meade was one of the Generals I could have named from the top of my head. 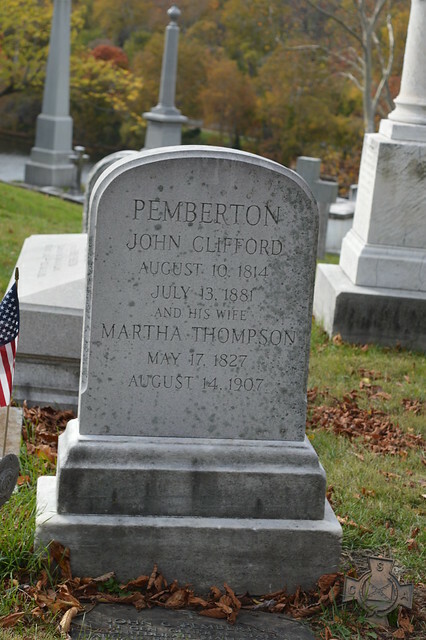 John Clifford Pemberton, on the other hand, is the only Confederate General buried at Laurel Hill Cemetery. 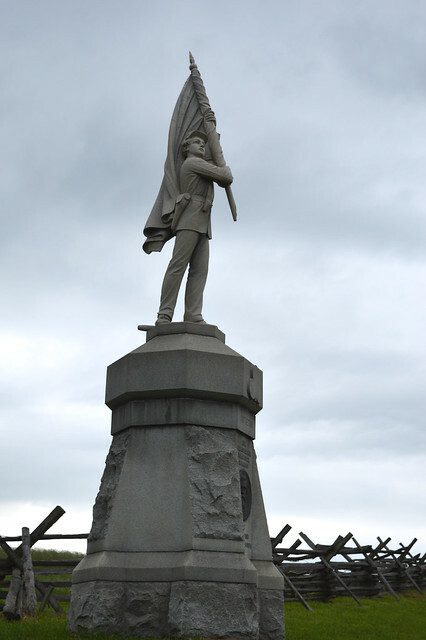 Despite being a northerner and having two brothers fighting for the Union, Pemberton had chosen to fight for the Confederacy for personal reasons. As a Confederate, his internment in Laurel Hill had been controversial. 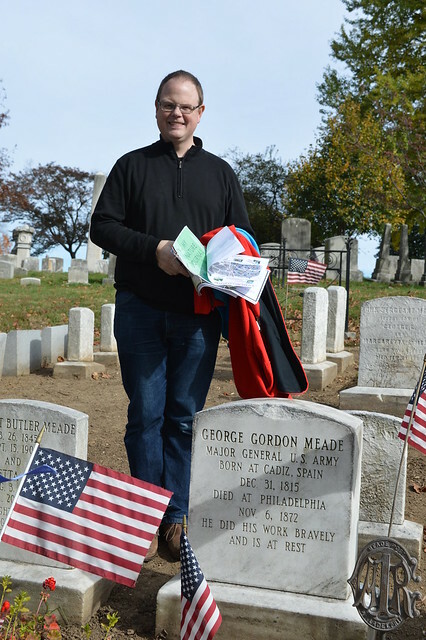 Among those who campaigned against his burial there were the family of General Meade. Ultimately he is there, albeit in a far flung corner of the cemetery. 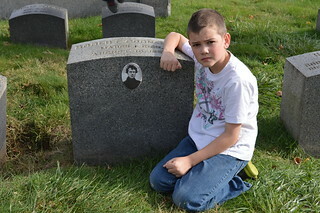 Finally, we visited the graves of several people associated with the sinking of The Titanic. I almost literally stumbled over the plot where Lily and Olive Potter, who survived the sinking, were buried. 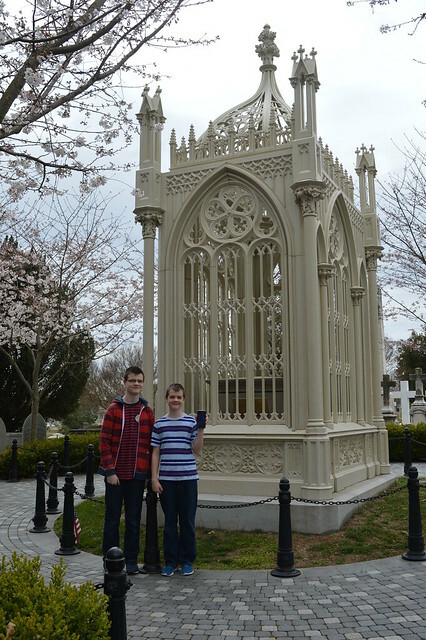 We then found the Widener Mausoleum on the stretch of the cemetery known as Millionaire’s Row. 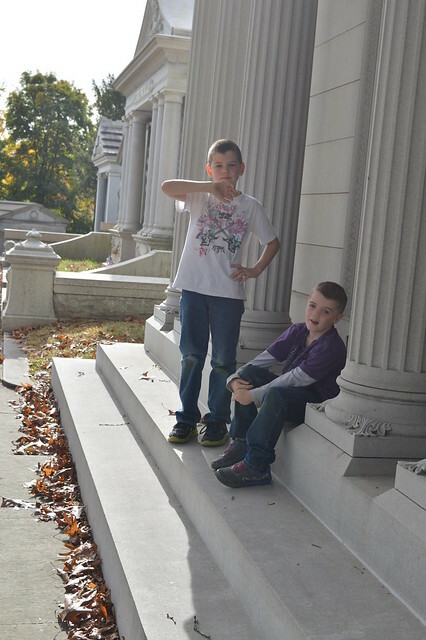 The Mausoleum is actually dedicated to Peter A B Widener, the wealthy Philadelphia businessman and philanthropist. 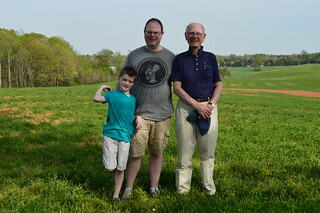 His son, George, and grandson, Harry are also commemorated there. Both men drowned when the Titanic sank and their bodies were never recovered. George’s wife Eleanor survived and she established Harvard’s famous Widener library in memory of her son, a passionate collector of rare books. 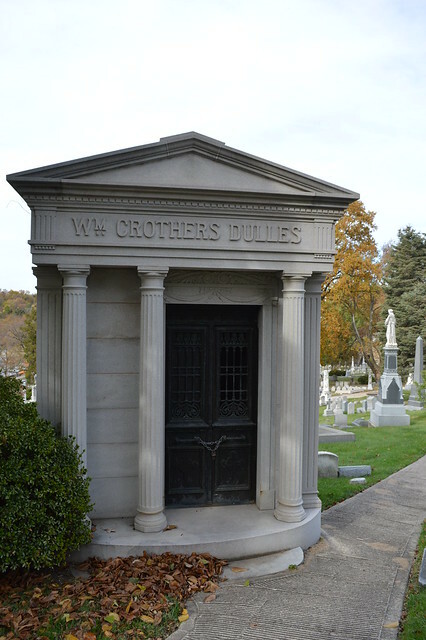 Lastly, we found the mausoleum of William Crothers Dulles. Dulles’ was one of the few bodies recovered from the Atlantic and identified, this due to his monogrammed tie clip. I recognise I have filled this blog post with the potted histories of dead celebrities. 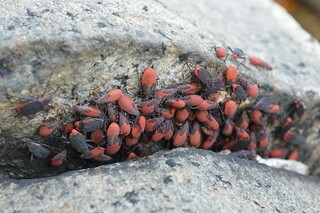 This is because that is something I find it interesting to do when pootling around in cemeteries. I like the way cemeteries and graveyards intersect with history, whether that is family history, social history, national or global history. 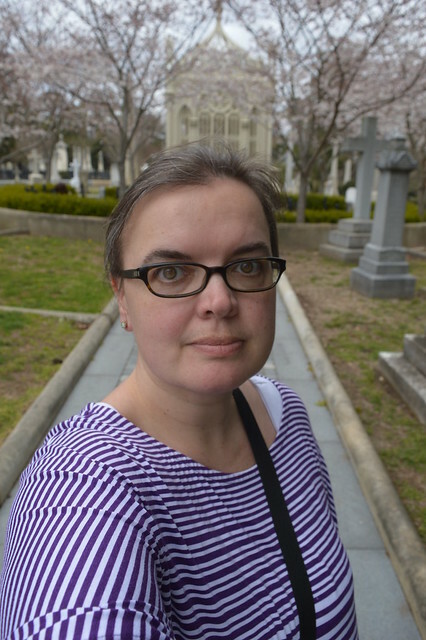 It is in large part because I am a history nerd that I love to visit cemeteries. However, I also love cemeteries simply because they are lovely spots of wander around in, an oasis of calm and serenity away from the hustle and bustle of the town or city. 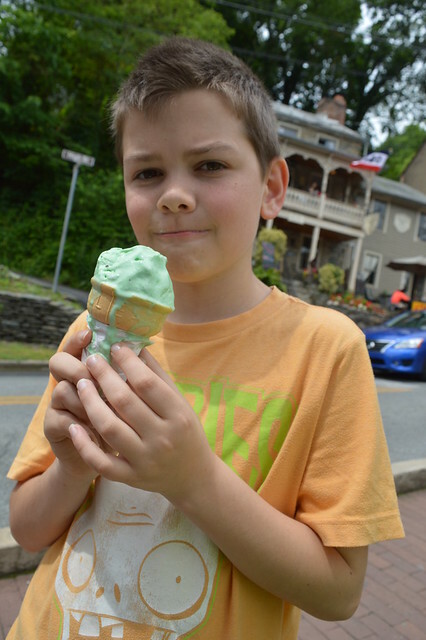 Laurel Hill had plenty of that to offer too. The views across the river and to the rest of the city were pretty impressive, especially when we got onto higher ground, and the Autumn colour in the trees was magnificent. 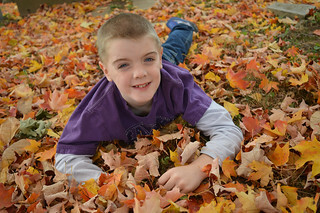 The boys particularly enjoyed playing in a huge pile of orange leaves. 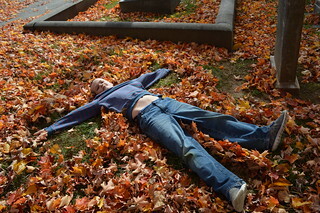 They rolled around in them, threw leaves in the air, jumped into piles of them, and made “leaf angels” in them. 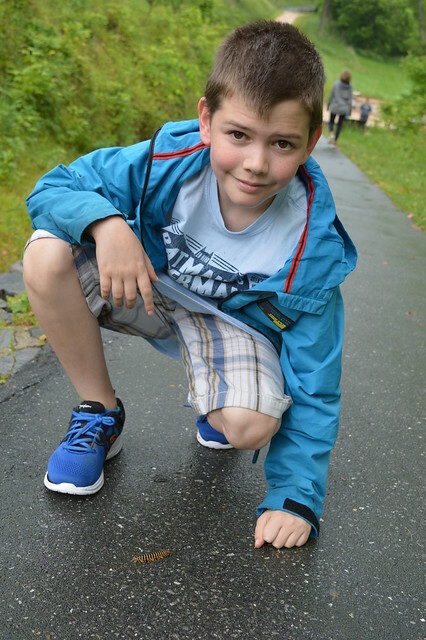 My 9 year old also made several insect and invertebrate friends on his travels. 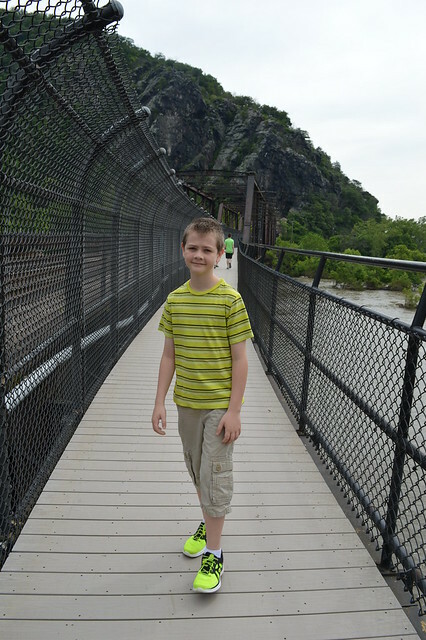 The kids also enjoyed having the freedom to roam. 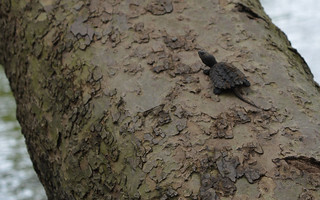 Normally on trips into the city, I have to rein them in a bit in order to keep an eye on them and stop them getting lost. 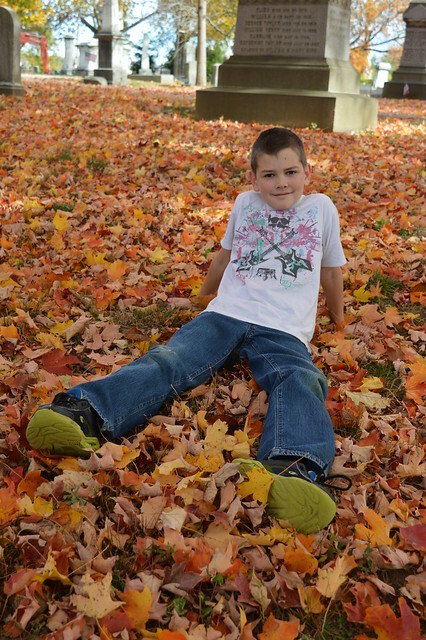 But in a quiet cemetery, it was possible to let them wander around and explore and be their feral little selves so long as they didn’t wander too far. Them having a bit of freedom also afforded me the opportunity to seek out the graves I was interested in and also enjoy the monumental sculpture in the cemetery. 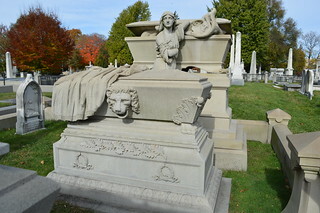 One of the most impressive of these was the sculpture on the Warner grave. The sculpture depicts a soul emerging from the tomb which is being opened by a female figure. 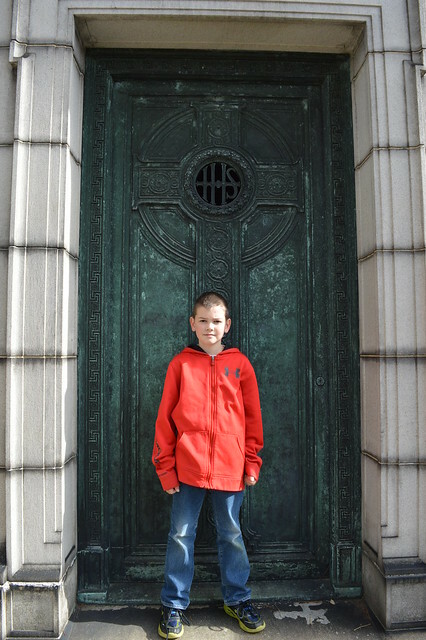 The tomb was sculpted by Alexander Milne Calder, fellow Scot and originator of the Calder sculpting dynasty. 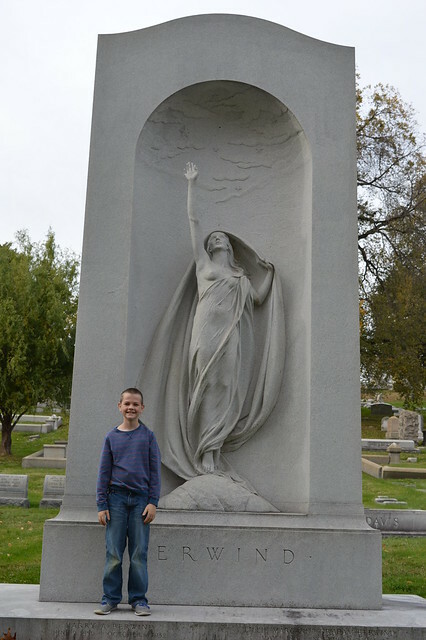 The other tomb I really liked was one for a family named Berwind which is marked by a beautiful figurative sculpture titled Aspiration by another local sculptor, Harriet Whitney Frishmuth. 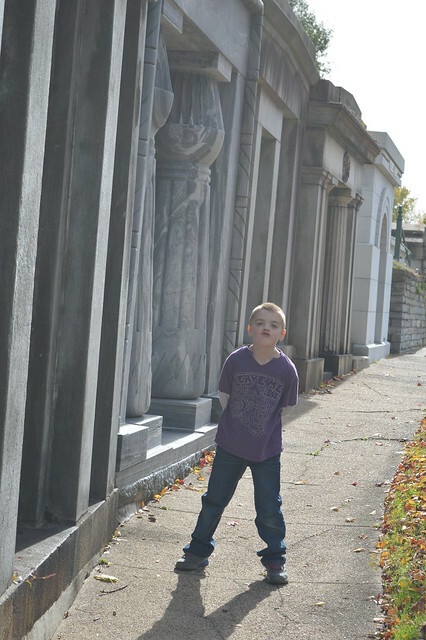 As you can no doubt discern, I was in nerdy cemetery heaven at Laurel Hill Cemetery. Had I been on my own, I could have kept meandering around the vast cemetery for hours longer. As it was, Mr Pict and the Pictlings were very tolerant and allowed me plenty of time to explore, locate graves, and take photographs. 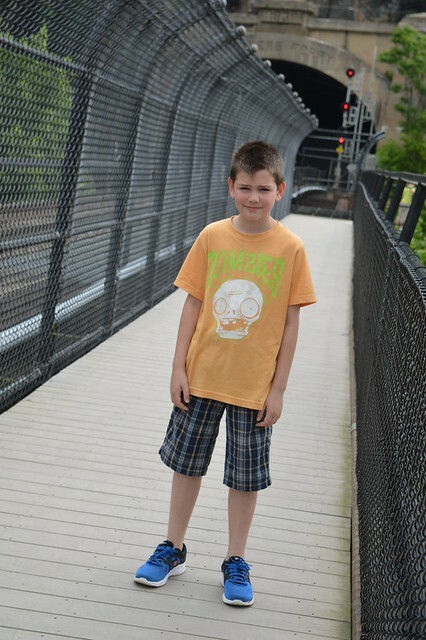 After the cemetery, we headed into the city centre for my birthday meal. We ended up ditching the booking Mr Pict had made at one restaurant because we were too early for the full menu to be available and instead ended up at a Chinese restaurant where we had an amazingly delicious feast and the boys sampled and enjoyed things they might otherwise have not tried. All in all, therefore, it was a very successful birthday trip.